The Alaskan Malamute is similar to other arctic breeds, such as the Greenland dog, Canadian Eskimo Dog, the Siberian Husky, and the Samoyed. 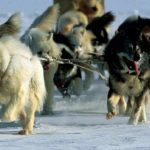 The first dogs arrived in the Americas 12,000 years ago; however people and their dogs did not settle in the Arctic until the Paleo-Eskimo people 4,500 years ago and then the Thule people 1,000 years ago, both originating from Siberia. Malamutes were thought to be created by the Malemiut Inupiaq people of Alaska’s Norton Sound region, who were a Thule people. The Malamute has been identified as a basal breed that predates the emergence of the modern breeds in the 19th Century. A study in 2013 showed that the Alaskan Malamute has a similar east Asian origin to, but is not clearly related to, the Greenland Dog and the Canadian Eskimo Dog, but contains a possible admixture of the Siberian Husky. 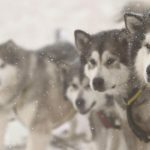 In 2015, a study using a number of genetic markers indicated that the Malamute, the Siberian Husky, and the Alaskan husky share a close genetic relationship between each other and were related to Chukotka sled dogs from Siberia. They were separate to the two Inuit dogs, the Canadian Eskimo Dog and the Greenland dog. 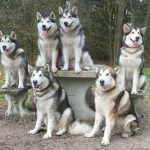 In North America, the Malamute and the Siberian Husky both had maintained their Siberian lineage and had contributed significantly to the Alaskan husky, which showed evidence of crossing with European breeds that was consistent with this breed being created in post-colonial North America. 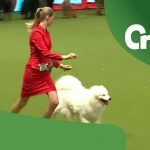 The Kennel Club breed standard describes a natural range of size, with a desired size of 23 inches (58 cm) tall and 75 pounds (34 kg) for females, 25 inches (64 cm) tall and 85 pounds (39 kg) for males. Heavier individuals (90 lb (41 kg)) and dogs smaller than 75 pounds (34 kg) are commonly seen. There is often a marked size difference between males and females. Weights upwards of 100 pounds (45 kg) are also seen. The coat of the Alaskan Malamute is a double coat. The undercoat has an oily and woolly texture and can be as thick as two inches. The outer guard coat is coarse and stands off the body—longer at the withers but not more than one inch off the sides of the body. Ears are small in proportion to the head and stand firmly erect when at attention. The Alaskan Malamute is a heavy dog, with a more formidable nature and structure than the Siberian Husky, which is bred for speed. The Alaskan Malamute is bred for power and endurance, which is its original function and what the standard of the breed requires of Alaskan Malamute breeders. The usual colors are various shades of grey and white, sable and white, black and white, seal and white, red and white, or solid white. There are a wide range of markings in the breed including face markings, blazes, a splash at the nape of the neck, and a collar or half collar. In terms of color variants, some Malamutes exhibit a dark grey to buff-colored undertone around their trimmings and white areas, presenting with a color-linked gene known as ‘Agouti’. The eyes of the Alaskan Malamute are almond-shaped and are varied shades of brown; however, the darker eye is preferred. The physical build of the Malamute is compact and strong with substance, bone and snowshoe feet. According to the breed standard, the Malamute’s tail is well furred and is carried over the back like a “waving plume”. Corkscrew tails are occasionally seen but are faulted in the breed standard (a corkscrew tail is commonly seen in the Akita). The Malamutes’ well-furred tails aid in keeping them warm when they curl up in the snow. They are often seen wrapping the tail around their nose and face, which presumably helps protect them against harsh weather such as blowing snow. Their ears are generally upright, wedge-shaped, small in proportion to the head and set to the side of the skull. The muzzle is deep and broad, tapering slightly from the skull to the nose. Nose and gums are black but some Malamutes have a snow nose, which is black with a pink undertone that can get darker or lighter, depending on the season. 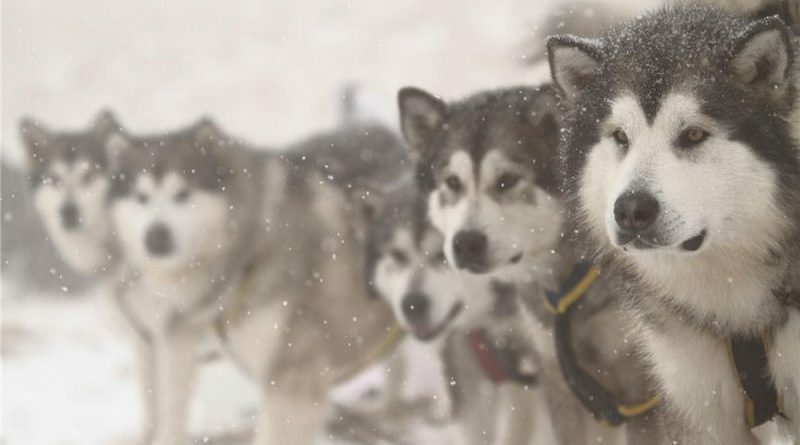 Alaskan Malamutes are still in use as sled dogs for personal travel, hauling freight, or helping move light objects; some, however, are used for the recreational pursuit of sledding, also known as mushing, as well as for skijoring, bikejoring, carting, and canicross. However, most Malamutes today are kept as family pets or as show or performance dogs in weight pulling, dog agility, or packing. Malamutes are generally slower in long-distance dogsled racing against smaller and faster breeds, so their working usefulness is limited to freighting or traveling over long distances at a far slower rate than that required for racing. They can also help move heavy objects over shorter distances. An adult male Alaskan Malamute can pull around 500–1,500 kilograms (1,100–3,300 lb) of weight, depending on build and training. The Malamute has a long genetic foundation of living in harsh environments, and many of its behaviors have adapted to survive in such environments. Independence, resourcefulness, high intelligence and natural behaviors are common in the breed. Malamutes, like other Northern and sled dog breeds, can have a high prey drive, due to their origins and breeding. This may mean in some cases they will chase smaller animals, including other canines, as well as rabbits, squirrels, and cats; however, this has been difficult to document in detail beyond anecdotal, observational data and many Malamute owners have observed varying levels of prey drive between individual dogs. 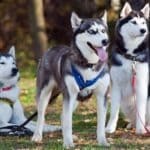 So while Malamutes are, as a general rule, particularly amicable around people and can be taught to tolerate smaller pets, it is necessary to be mindful of them around smaller animals and small children. Malamutes are very fond of people, a trait that makes them particularly sought-after family dogs, but unreliable watchdogs. Malamutes are nimble around furniture and smaller items, making them ideal house dogs, provided they get plenty of time outdoors meeting their considerable exercise requirements. If they are year-round outdoor dogs, letting them play in a baby pool filled with cold water in summer keeps them cool. In the winter, they love snow. Malamutes are usually quiet dogs, seldom barking. When a Malamute does vocalize, it often appears to be “talking” by vocalizing a “woo woo” sound. It may howl like a wolf or coyote, and for the same reason. There is only one known health survey of Alaskan Malamutes, a 2004 UK Kennel Club survey with a small sample size of 64 dogs. 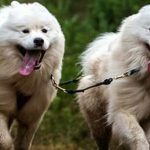 The median lifespan of 10.7 years measured in that survey is typical of a breed their size; however, this study had a sample size too small to be considered reliable and much anecdotal evidence suggests they have on average one of the longest lifespans of large dogs, up to 15 years. The major cause of death was cancer (36%). The most commonly reported health problems of Alaskan Malamutes, in the 2004 UK Kennel Club survey were musculoskeletal (hip dysplasia), and hereditary cataracts. 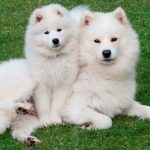 There are additional health issues in the breed whose origins are unknown at this time including varied seizure disorders found in young puppies as well as adults, epilepsy, congenital heart problems, kidney problems and skin disorders. Other health issues in Malamutes include Elbow dysplasia, inherited polyneuropathy, chondrodysplasia, cerebella hypoplasia, heart defects, and eye problems (particularly cataract and progressive retinal atrophy). 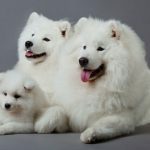 A growing problem among arctic dog breeds, including the Alaskan Malamute, but especially their cousin, the Samoyed, is canine diabetes with onset occurring typically in middle age (5 to 7 years). The Alaskan Malamute had a prominent role with their human companions – as a utilitarian dog, working, hunting, and living alongside humans. The dogs were renowned for their excellent hunting abilities and were used to hunt large predators such as bears. They also aided their owners in finding seals by alerting to seal blow holes. The interdependent relationship between the Mahlemut and their dogs fostered prosperity among both and enabled them to flourish in the inhospitable land above the Arctic Circle. For a brief period during the Klondike Gold Rush of 1896, the Malamute and other sled dogs became extremely valuable to recently landed prospectors and settlers, and were frequently crossbred with imported breeds. This was often an attempt to improve the type, or to make up for how few true Malamutes were available to purchase. Losses from service in World War II all but eliminated the breed. In 1947 there were estimated to be only about 30 registered dogs left, so the stud book was reopened. Mr. Robert J. Zoller became involved in the breed and took this opportunity to combine M’Loot and Hinman/Irwin dogs with selected Kotzebues to create what became the Husky-Pak line. All modern Malamutes are descended from the early strains, and show combinations of characteristics in greater or lesser degree. Thus the natural differences we see today. The Malamute dog has had a distinguished history; aiding Rear Admiral Richard Byrd to the South Pole, and the miners who came to Alaska during the Gold Rush of 1896, as well as serving in World War II primarily as search and rescue dogs in Greenland, although also used as freighting and packing dogs in Europe. 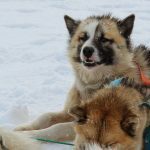 This dog was never destined to be a racing sled dog; it was used for heavy freighting, pulling hundreds (maybe thousands) of pounds of supplies to villages and camps in groups of at least 4 dogs for heavy loads. In 2010 the Alaskan Malamute was named the official state dog of Alaska. Thanks for visiting the Northernwolf Sled Dog Information Site. We hope you find this site informative. Please do not hesitate to contact us if you have any feedback / questions about Sled Dogs or specific breeds or this site in general. Copyright © 2019 Northernwolf. All rights reserved.